Washington State’s largest city of Seattle is a northwest wonder that’s unlike any other destination in America. 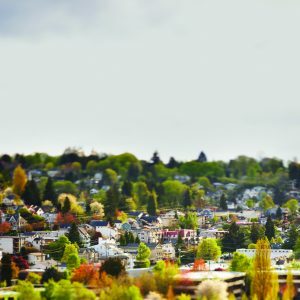 Unique neighborhoods and historic districts, iconic and lesser-known attractions, new offerings, varied dining, lots of water-based pursuits, and more, all combine to make Seattle and beyond one of America’s most unique destinations. 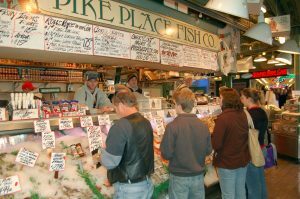 Of course, Pike Place Market is right on the water in the heart of downtown and it’s a great place to start. 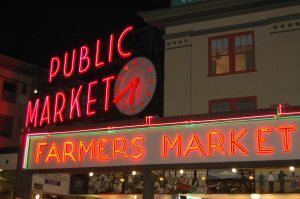 Presiding over a nine-acre historic district, Pike Place Market is located between First and Western Avenues, bound by Union and Stewart Streets. Rachel, the famous bronze piggy bank, is near the main entrance. So is Pike Place Fish Company, home of the famous fish-throwers. The main level features other seafood shops, colorful flower stalls, and lots of produce stands, while the lower level offers one-of-a-kind shopping stops. Opened in 1971, the original Starbucks is located in Pike Place Market. Street musicians, sanctioned by the Pike Place Market Preservation Development Authority, entertain at designated locales throughout the market. Various Pike Place Market tours are highly recommended. A short walk along the Seattle Waterfront reveals stunning views of Elliott Bay (teeming with ferry tour boats, cruise ships, pleasure craft, and more) and the Olympic Mountains before arriving at the Olympic Sculpture Park. This sculpture museum features 20-plus groundbreaking large-scale sculptures spread throughout the 9-acre outdoor setting. Prime harbor views can be found on the central waterfront along Alaska Way between Pier 70 to the north and Pier 48 to the south. About midway, the ever-popular Seattle Aquarium is built atop Pier 59. Offering sightseeing tours and evening dinner cruises, Argosy Cruises is also situated at Pier 59. There’s also Tillicum Village and Blake Island Marine State Park, with a scenic boat trip to nearby Blake Island for a Northwest Coast Native American stage show (Argosy Cruises offers these excursions). Much larger ships can be found at Pier 66’s Bell Street Cruise Terminal, homeport to many cruise ships bound for Alaska’s Inside Passage and beyond. A second cruise terminal is located at Pier 90. Relatively new to the city (2012) is the 175-foot Seattle Great Wheel on Pier 57. It’s one of the largest Ferris wheels in the United States. The bustling Seattle Waterfront also features gift and souvenir shops and a tasty selection of Northwest seafood dining and more. The Seattle Center is also nearby and hard to miss. Here, Seattle explorers can speed up an elevator in the 605-foot Space Needle to the 520-foot-high observation deck. The 74-acre urban park is a legacy of the 1962 Seattle World’s Fair. There’s also don’t-miss contemporary popular culture at Frank Gehry-designed EMP Museum (founded by Microsoft co-founder, Paul Allen, and dedicated to American popular music), the Pacific Science Center, Seattle Opera, Pacific Northwest Gallery, Seattle Repertory Theatre, Seattle Children’s Theatre, Children’s Museum, Seattle, and Chihuly Garden and Glass—the most comprehensive collection of Dale Chihuly’s artwork ever assembled in one place. The Seattle Center also hosts many of the city’s largest festivals, including Bumbershoot (Seattle’s Music & Arts Festival), the Northwest Folklife Festival, the Bite of Seattle, and more. Next, Seattle’s historic district—Pioneer Square—is located on the southern fringe of downtown’s business core. As a burgeoning lumber town in the 1800s, logs skidded down the area’s streets to harbor-side sawmills. Seattle’s quick growth came to a quick standstill when a big fire in 1889 destroyed many of the wooden buildings. However, the town was quickly rebuilt and Seattle served as a bustling staging area for Alaska’s Klondike Gold Rush in the 1890s (interpreted at Klondike Gold Rush National Historic Park). Today, the Pioneer Square neighborhood features about 20 square blocks of Victorian Romanesque architecture, museums, art galleries, restaurants, and nightlife. Below the modern street level, the Underground Tour is a great way to explore remnants of the old town below. 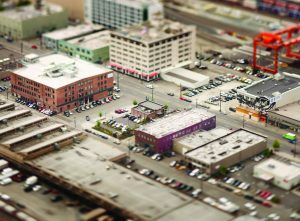 Bound by Yesler Way and Dearborn Street on the north and south and Interstate 5 and Fourth Avenue on the east and west respectively, Seattle’s International District spans about 45 blocks south of downtown. Chinese immigrants originally started coming to Seattle in the 1860s, working in the city’s saw mills, rail lines, and fishing boats. Today, the busy neighborhood includes Chinese, Filipino, Japanese, Vietnamese, and Southeast Asians. There are many highly-recommended tour possibilities. Chinatown Discovery Tours (a subsidiary of The Wing Luke Museum of the Asian Pacific American Experience, otherwise known as “The Wing” and known for its Bruce Lee exhibition) offers several themed guided walks through the district. A Touch of Chinatown provides a 90-minute introduction, while a Taste of Chinatown includes a six-course dim sum lunch. Located at Fifth & Weller, Uwajimaya is of the largest Asian grocery and gifts stores in America. Depending on visitor interests, other Seattle museum and attraction options include: the Seattle Art Museum (SAM); the Seattle Asian Art Museum; the Museum of History & Industry (MOHAI, including the new Bezos Center for Innovation, supported by Amazon CEO Jeff Bezos, and his wife, MacKenzie); Woodland Park Zoo; the Museum of Flight (including the new $22 million Aviation Pavilion); and Paul G. Allen’s Flying Heritage Collection, which recently opened a second hangar that displays some of the rarest World War II war birds and artifacts in the world. Located on the campus of the University of Washington, the Burke Museum of Natural History & Culture is one of the foremost natural history museums in the nation. Ranging from Native American totem poles and hand-carved canoes to dinosaur skeletons, fossils, gems, and minerals, it features both natural and cultural artifacts from the Pacific Northwest and the Pacific Rim. Also on campus, the Henry Art Gallery is the art museum of the University of Washington and is located in a stunning Charles Gwathmey-destined glass and textured steel building. It’s one of the region’s premier modern and contemporary art museums. Seattle shopping is also a major attraction. Seattle “brands” include: Amazon Books; Eddie Bauer; Sur la Table; Tommy Bahama; and Columbia Sportswear. Varied boat, Ride the Duck land and sea tours, seaplane, and helicopter tours offer additional unique ways to explore the city and the truly stunning surrounding landscapes and seascapes. The sightseeing possibilities include Puget Sound, the San Juan Islands, the Cascade and Olympic Mountains, Mount Ranier, Mount Saint Helen, and even excursions up to Victoria and Vancouver in Canada’s British Columbia. Clipper Vacations operates regular catamaran service between Pier 66 and Canada’s Victoria, British Columbia (year-round) and Washington State’s San Juan Islands (seasonally). The Victoria Clipper IV can travel up to 30 knots and is known as one of fastest passenger vessels in the Western Hemisphere—making the Seattle-Victoria trip is just 2 ½ hours. Clipper Vacations also offers a wide range of single and multi-day excursions via catamaran, motor coach, and train throughout the Northwest and Canadian Rockies. The Washington State Ferry system is the largest in America and carries more than 23 million passengers each year onboard 24 vessels from 20 terminals. 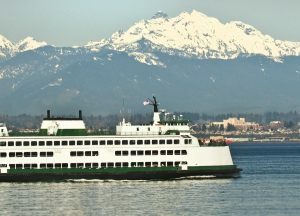 From the Seattle Waterfront, ferries carrying up to 2,500 passengers and 200-plus vehicles travel to and from Brementon on the Olympic Peninsula (60 minutes one-way) and Bainbridge Island (35 minutes one-way). Both routes feature panoramic views of the Seattle Skyline and harbor for quick cross-sound sightseeing trips. Up in the air, Kenmore Air is the largest full-service seaplane operation in the world. The company boasts a fleet of 25 planes, which annually log more than two million miles and carry more than 125,000 passengers. Regular flights between the airline’s two Seattle terminals (located at Lake Union just north of downtown and Kenmore, ten miles north on Lake Washington) feature the San Juan Islands, Oak Harbor, Victoria, the Gulf Islands, Vancouver, and Alaska’s Inside Passage. Their highly-recommended and popular 20-minute “flightseeing” trips provide a perfect introduction to their offerings. 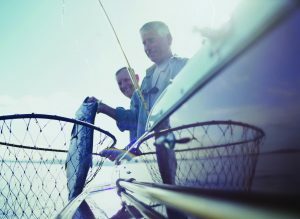 Additionally, special packages and excursions include sport fishing, whale watching, waterside picnics, and more. Seattle Seaplanes also offers year-round 20-minute flights from Lake Union. In addition, “dinner flights” to popular restaurants and resorts in the San Juan Islands, Victoria, Port Townsend, and the towns of Port Ludlow, Port Hadlock, and Poulsbo on the Kitsap Peninsula are popular options. Come evening, Seattle culture and cuisine beckon. The Seattle Opera and the Pacific Northwest Ballet both perform in McGaw Hall at the Seattle Center, while the Seattle Symphony Orchestra plays at Benaroya Hall. For dinner, it’s hard to beat fabled and fresh Northwest cuisine and more at one of award-winning chef Tom Douglas’s menu of many restaurants—like Etta’s Seafood, Serious Pie pizzerias, Greek-fusion Lola’s, Northwest-inspired Palace Kitchen, and many more. Douglas also operates Hot Stove Society, a year-round cooking school. Described as equal parts sports bar, pool hall, and sporting goods store his newest concept—The Carlile Room—opened last summer and was inspired by local singer Brandi Carlile. However, there are many other options for taking a big bite of Seattle. Along with Tom Douglas, Seattle has more than a dozen other James Beard Award winners, including Renee Erickson, Matt Dillion, and Jason Wilson. Five Seattle celebrity chefs (Douglas, Erickson, Dillion, Ethan Stowell, and Josh Henderson) oversee nearly 50 Seattle restaurants. Of course, fresh seafood is a Seattle favorite and local oysters are easy to find. Many city restaurants have started their own “oyster happy hours,” with oysters sometimes as low as $1.00 each. Local favorites include Elliott’s Oyster House, Shuckers, The Walrus and the Carpenter, Taylor Shellfish Company, and Westward. Asian cuisine is also a must in Seattle. Top picks include: dim sum at Jade Garden, sushi at Maneki, authentic ramen at Tsukushinbo, Vietnamese street noodles at Hue Ky Mi Gia, and more. Varied food tours offer another option. Many tours are specialized by specific culinary hubs, cuisines, neighborhoods, or industries. Companies to contact include: Eat Seattle; Savor Seattle; Seattle Food Tours; and Taste Seattle Food Tours. Washington State wines pair perfectly will all of these eating options. Now the nation’s second largest producer of premium wines and boasts more than 850 wineries—including nearby Chateau Ste. Michelle in Woodinville and more than two dozen trendy “urban wineries” within the city of Seattle. These hotspots provide a great way to toast Seattle, America’s Northwest wonder. 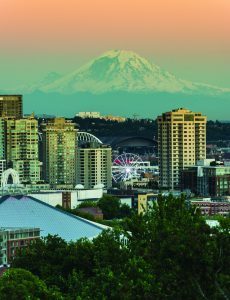 To plan a trip to Seattle, go to www.visitseattle.org or call (866) 732-2695. To plan your stay, visit thousandtrails.com.